Allegiant Air begins 2014 with aspirations of launching transborder service to Mexico, betting it can replicate its business model in near-international markets. Its approach to international service seems a bit more conservative than its experiment in Hawaii, which has perhaps not lived up to the carrier’s initial expectations. Despite some missteps in trans-Pacific service to Hawaii, Allegiant’s financial position has remained strong, and its ultra low costs are the best in the US aviation industry. Those results show Allegiant’s underlying business model remains strong, and the carrier is confidently planning capacity growth ranging from 9% to 13% during 2014 with Orlando Sanford playing a prominent role in its network. Through its low fare, low frequency routes from small US cities to large leisure markets Allegiant remains the only true niche carrier in the US. And with no significant challenger to its business model, Allegiant seems poised to sustain its favourable financial results. The number of passengers travelling on Allegiant during 2013 grew 3.6% year-on-year to 7.3 million. While the growth is healthy, Allegiant still only represents a small fraction of US domestic passengers. Its niche strategy has never depended on scale in order to achieve consistent profitability – Allegiant has recorded profits during the last 43 quarters (excluding a non-cash hedge adjustment in 2008 and a one-time tax adjustment in 4Q2006). At the end of 3Q2013 Allegiant’s debt to EBITDA ratio was 0.9, and its EBITDA of USD219 million outpaced its capex spend for 12M ending 3Q2013 of USD178 million, a consistent trend since 2011. 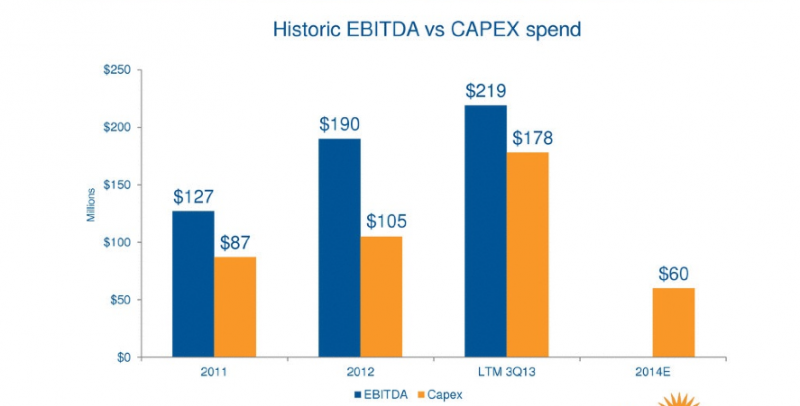 Its year-on-year capex for 2014 is estimated to drop approximately 66% to USD60 million. Allegiant also touts its performance in a little discussed metric – return on invested capital minus weighted average cost of capital, concluding the returns it generated based on that formula during 2012 were superior to some of its US peers. Allegiant’s USD5.5 unit cost for the 12M ending 3Q2013 were also better than a number of other carriers even though it calculates average aircraft utilisation of just under six hours per day compared with nearly 13 hours by Spirit, whose unit costs for the same period were approximately USD6 cents. One of the tenets of Allegiant’s ultra low cost has been the low ownership expense it enjoyed from its mature fleet of MD-80 aircraft. But the fuel inefficiency of those jets has taken its toll and Allegiant during the past couple of years has been looking for used Airbus narrowbodies that still provide an ownership cost advantage while offering improved fuel consumption. Allegiant expects to end 2014 with nine Airbus A320s and four A319 narrowbodies. The company is particularly bullish on the cost advantage of its 177-seat A320s, estimating the jets are 15% more fuel efficient than the MD-80s. 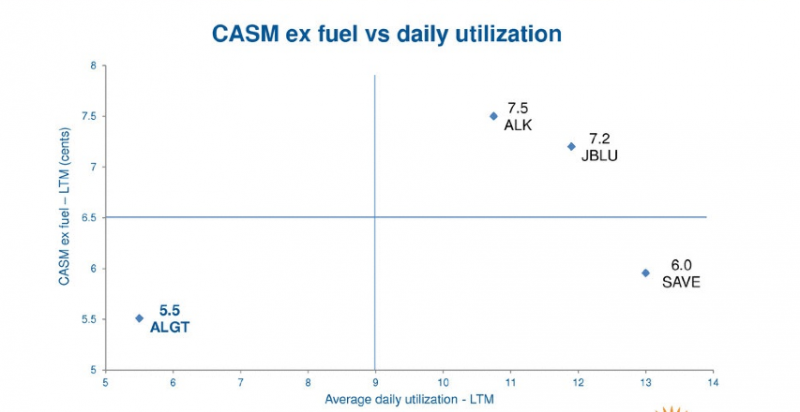 With a combined 10 Airbus narrowbodies in its fleet at YE2013, Allegiant estimates its fuel consumption measured in ASM (available seat miles) per gallon improved from 58.4 to 67.4 (calculations were supplied in Nov-2013). Allegiant launched service to Hawaii in 2012 after a long ETOPs approval process for the Boeing 757's operation on the trans-Pacific routes. It slowly added service from several small cities mainly to Honolulu (it also offered service from Maui to Bellingham). At one point it served Boise, Eugene, Phoenix, Spokane, Fresno, Stockton, Santa Maria and Bellingham from Honolulu. During Aug-2013 it seasonally eliminated flights to Boise, Eugene, Phoenix, Spokane, Fresno, Stockton and Santa Maria, and remarked that it was uncertain how many of the markets would return. According to current schedules in OAG (13-Jan-2014 to 19-Jan-2014), Allegiant offers flights from Honolulu to Bellingham, Boise, Las Vegas, Los Angeles and Spokane. The carrier’s logic in serving the busy Los Angeles-Honolulu market is that it has a sizeable database which it can use to market service to Honolulu, with the conclusion that some of the smaller markets are tough to serve from Hawaii year-round at favourable price points. Allegiant was also plagued by industry overcapacity between the US mainland and Hawaii as it was launching its new services to Honolulu. During 2H2013 some capacity rationalisation returned to the market, so perhaps improved competitive dynamics coupled with Allegiant’s better understanding of serving Hawaii will produce a more favourable performance for the carrier in Honolulu during 2014. A significant milestone for Allegiant during 2014 is the launch of service to Mexico. Previously, Allegiant has stated its intent to serve Los Cabos and Hermosillo. The rationale in selecting Hermosillo was to tap Mexico’s growing middle class with disposable income and propensity for travel. Allegiant believes it can craft an attractive offer for those customers to fly to larger US leisure destinations such as Las Vegas. During late 2013 Allegiant was still uncertain regarding a specific start date for new service to Mexico, citing the automation necessary to initiate sales and comply with Mexican regulations. Its roll-out to Mexico is expected to be more measured than Hawaii, as the A319s that can amply serve the hot and high conditions of many Mexican airports will remain a small portion of Allegiant’s fleet. By year-end 2015 it will only have 10 of the type in its fleet. Allegiant has also learned valuable lessons with its experiment in Hawaii as the carrier previously declared its intent to grow Mexico conservatively. Florida has always been a strategic market for Allegiant, but its importance seems to be growing as the carrier’s network evolves (and perhaps costs rise at its largest base Las Vegas). Orlando Sanford is presently Allegiant’s second largest base. 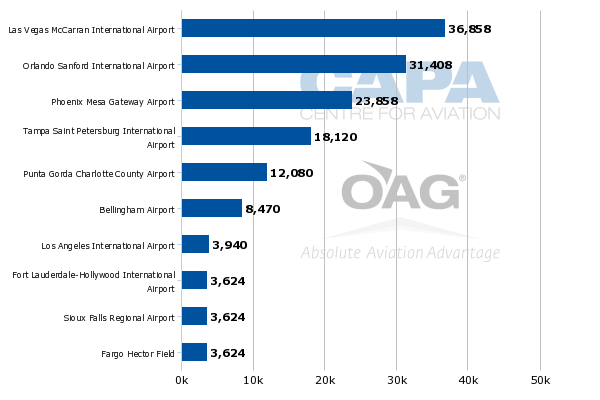 And based on schedules in OAG, Allegiant only deploys approximately 5,400 additional seats from Las Vegas compared with Orlando. During late 2013 Allegiant launched a number of new markets from Sanford including Concord, North Carolina; Charlottesville, Virginia; Oklahoma City, Oklahoma; Clarksburg, West Virginia; and St Cloud, Minnesota. Allegiant’s total markets from Sanford number more than 50, and it also recently introduced service from St Petersburg near Tampa to Syracuse, New York and from Punta Gorda in south Florida to Cedar Rapids, Iowa. Allegiant sees more upside to bases in Florida – Sanford, St Petersburg, Punta Gorda and Fort Lauderdale – and plans to add more routes from some or all of those markets during the summer 2014 time frame. Another pillar of Allegiant’s seemingly successful strategy is that it remains uncontested in most of its markets. As of Nov-2013 it operated 207 routes, of which 23 or 11%, had competition. Of those 23, Southwest is the major competitor on 12 routes. One of the routes that Southwest and Allegiant overlap on is Las Vegas-Austin, a market Allegiant entered in Oct-2013. It is a more mainstream market for Allegiant, linking two large population centres, versus a typical St Cloud-Orlando pairing. Company executives recently fielded questions about the possibility of more mainstream routes appearing in Allegiant’s route network, but Allegiant management assured it has ample opportunities within its own niche, and doesn’t need to deviate from its current strategy. “We’ve had great success with our model for a long time,” Mr Levy concluded. 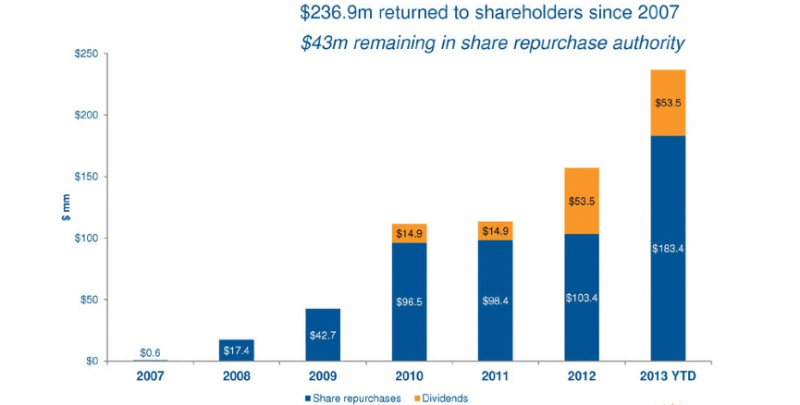 Perhaps no other metric reflects Allegiant’s success than shareholder returns. While Delta has resumed shareholder rewards after a 10-year hiatus and United’s aspiration is to deliver a return to shareholders, Allegiant has been repurchasing stock since 2007 and began issuing dividends in 2010. Allegiant’s projected 9% to 13% capacity growth for 2013 is significantly above its US counterparts, but given the markets it serves and its low passenger numbers relative to other US carriers, Allegiant’s capacity growth seems relatively benign. It is a safe bet Allegiant will continue its strategy of entering small markets abandoned by a consolidating US industry (mostly from Southwest and AirTran) during 2014 in addition to its international debut. Both initiatives seem like relatively safe bets now that Hawaii has taught Allegiant to perhaps temper its expectations with respect to how quickly it gains perspective of dynamics in certain markets. With demand holding steady for the moment, Allegiant’s comfort zone of linking small markets to large leisure destinations remains intact, giving the carrier a solid foundation to carry out new and more measured network experiments.